Check out his full review on Pop Culture Beast. What else does ComicBase 11 have in store for you? Check out the full review on About.com! PC Magazine recently gave ComicBase 10 a 4.5 out of 5, calling it " a must-have upgrade" for comic collectors. Why is PC magazine raving about the “ease of use, comprehensiveness, functionality, and timeliness" of ComicBase 10? Check out the full review on the PC Magazine site to find out! In his latest Golden Age of Comics podcast, Bill Jourdain reviews (and highly recommends) the new ComicBase 10, particularly praising the huge store of comic covers, weekly updates, PDA features, and barcode support. The review is right at the top of his show, which is also features a retrospective of Golden Age legend Will Eisner, and DC’s Special Edition Comics from 1944–1945. Thanks, Steve! Read the whole review here. 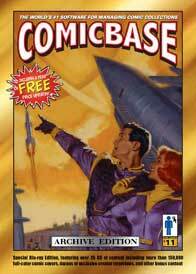 ComicBase creator Pete Bickford appeared as a guest Tuesday on World Talk Radio's Comic Zone show, talking about ComicBase 10 and the upcoming Atomic Avenue online system. Thanks to the miracle of instant internet archiving, you can hear the whole interview here. PC Magazine, gave ComicBase 9 Archive Edition a four-star review in the “After Hours” section of this month’s issue. PC Magazine gave raves to ComicBase 9 Archive Edition's new Grading Wizard, enormous database, and vast collection of cover art and video content (over 8 GB) on two DVD-ROMs. Check out the September issue of PC Magazine for the complete review.